It might sound like a cliché for me, but in all my time and association with the fishing industry, I have longed to go afloat on a trawler under steam. One day, perhaps, I might aspire to a trip offshore, (if a benevolent skipper will have me), but I won’t hold my breath! Of all the craft that ply their trade on the high seas, fishing vessels, be they trawlers, seiners, gill netters, scallopers, potters or drifters hold an allure for me like none other. I don’t know quite what it is, whether the lines, the displacement, the gear, or the sheer respect I hold for those who skipper and crew them, all combine in a goose-bump inducing and skin-tingling awe, that grips me whenever I enter a harbour or view them at sea at distance. 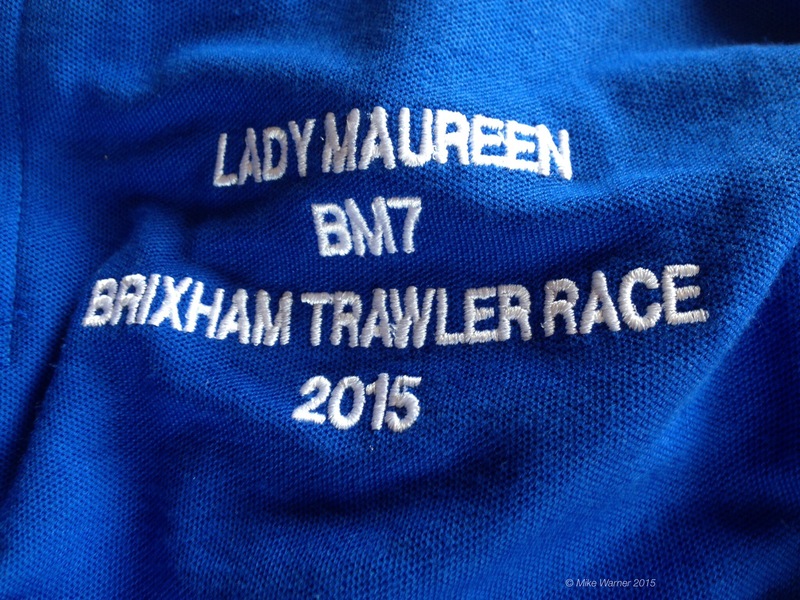 So imagine how I’m feeling on arrival at Brixham Harbour, resplendent in my new and just-presented polo shirt that bears my allotted vessel’s name, for the much famed and feted annual Trawler Race. 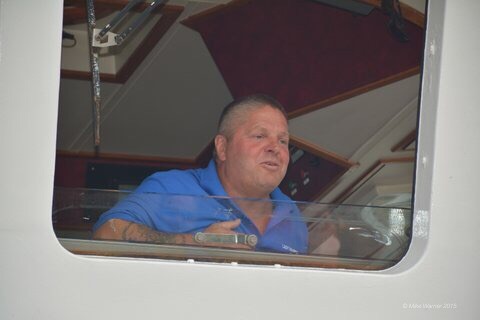 Barry Young, Chief Auctioneer and MD at Brixham Trawler Agents, has pulled it off. 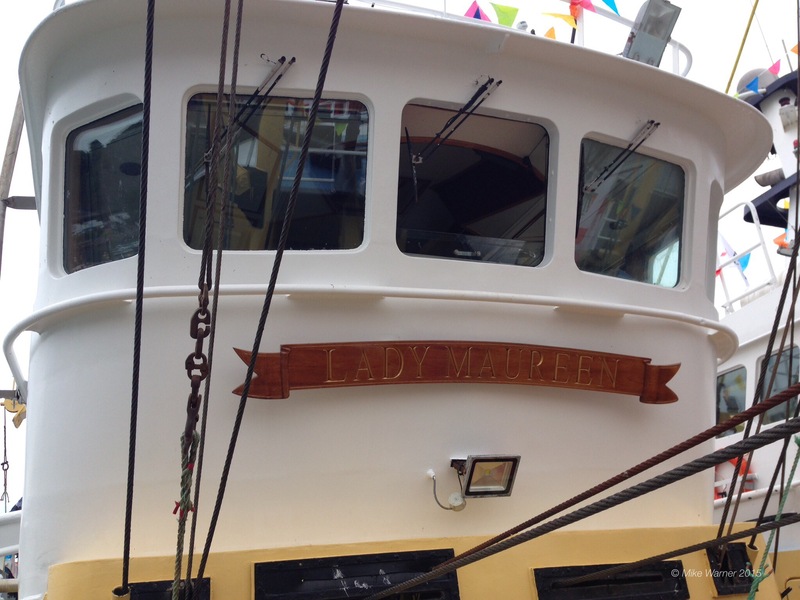 He’s only got me aboard the Lady Maureen (BM 7) a 24 metre Eurocutter owned by David Langdon of Langdon & Phillip Ltd- Trawler owners and fishers, operating five vessels out of the port, members of the Responsible Fishing Scheme and noted rugby fans. As I clamber eagerly across her sister vessel the Kerry Marie (BM172) and over the gunwales of the Lady Maureen, I anticipate that this is no ordinary day. 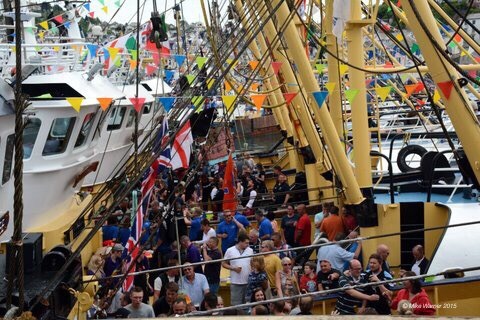 This annual, much-loved and galvanizing, maritime pageant, has its roots entrenched in the days of sail. Back in the early 20th century, sailing trawlers competed annually for the prestigious King George V cup. 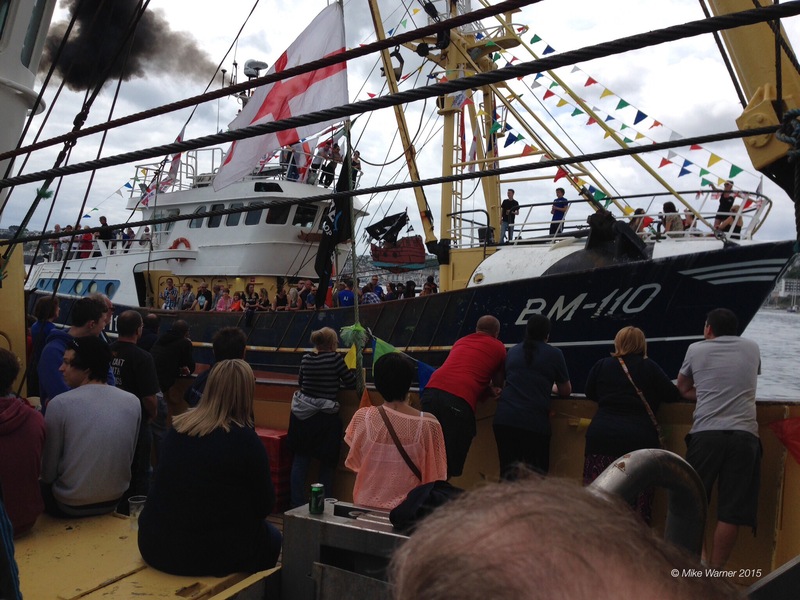 Steam superseded and following a break in continuity at the outbreak of the Second World War, racing was resurrected in the 1960’s with diesel engined trawlers, now working the ports around the UK. Race-going guests pile aboard, nourishment for the day’s escapades, by case and crate load, duly provisioned into any available space on deck. A tangible note of excitement builds like a looming squall, until Skipper Dave appears at the open wheelhouse window, sounds her siren and amidst mounting cheers and shouts, nudges her bow away from the Kerry Marie’s hull and glides her effortlessly toward the open sea and the circuit. As we clear the breakwater, a following tumult of siren-sound drifts out from the harbour, as our competitors slowly peel away from their berths and follow our track into Torbay, their bunting fluttering like multicoloured spring leaves in the still only slight, morning breeze. We steam slowly and steadily toward Berry Head and the assembly area. It’s at this point I’m informed that before the race can commence, the fleet will perform a reverent and heartfelt tribute, to recently departed, fellow skipper and Brixham legend, Jock Strike, lately taken afloat for his final trip at the premature age of 57, by steaming in line abreast, past the breakwater in sincere memorium. Fishermen are a breed like no other. A closely woven and interdependent bunch, who although fiercely competitive, remain incredibly loyal to their kind, their common bonds knitting them into the community and garnering a respect that pervades the atmosphere of any port or harbour of commercial landings you care to visit. It’s overwhelmingly obvious, as I talk to Dave, that he’s lost a very close friend. Loss and debilitating injury amongst fishermen is notoriously common, especially as the demands and stresses of their profession, coupled with working conditions that exist in no other industry, dictate a high incidence of trauma. Having survived these, it is all the more difficult to bear, when such a hardy soul succumbs to illness. When disaster does strike fishermen, at sea or ashore, the community always rallies and charity is swift to kick in for those dependents who might suddenly find themselves disadvantaged. 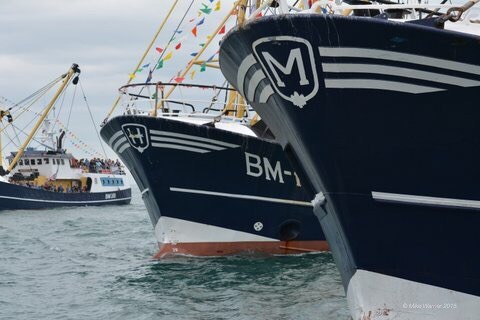 The Fishermen’s Mission is strongly represented amongst the charities of the Brixham Trawler Race and rightly so. The support they give families of those lost, injured, or for whatever reason left unable to work, is unconditional and hugely necessary. They deserve support in return and on a day such as this, it’s there in volume and without quota. The fleet steams solemnly past the end of Brixham’s famous breakwater and horns sound together in a fitting and moving tribute to their departed colleague. Leaving the breakwater astern, the boats then shuffle up to the starting line, each skipper having been assigned his own start time. 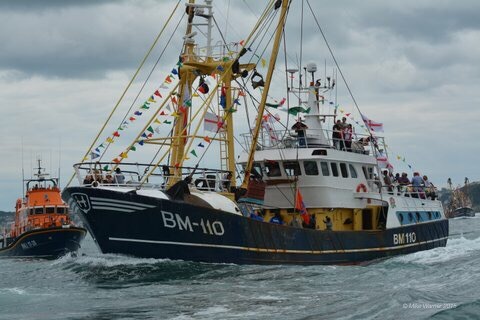 This year there are 17 Beamers (Beam Trawlers) and 4 smaller Under 10 metre day boat vessels participating. Tension builds. 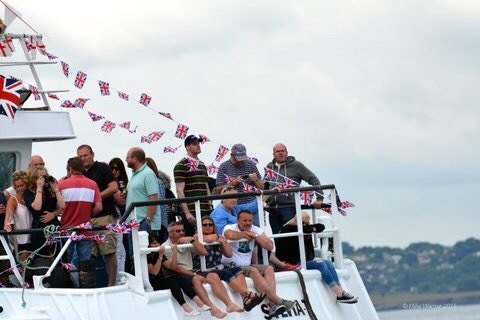 The course takes them in a wide circuit of Torbay, from the starting point just off Battery Green in Brixham, in a clockwise loop, that culminates in a thrilling and nail-biting finish, with the skippers jostling for place. The race is run on a handicap system, whereby each skipper considers the distance, the average speed of his boat and the fastest time he thinks he’ll be able to complete course in. 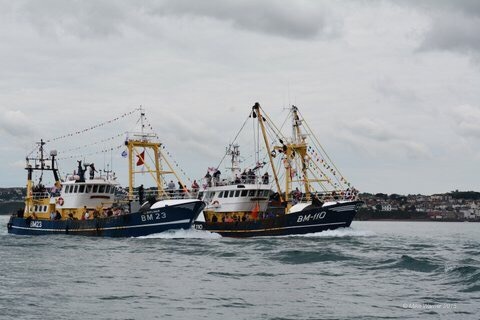 There are different classes too: the Beamers, the Scallopers, Day Boats and Crabbers and the winners of each section are those who achieve the time closest to their predicted lap. As our zero hour arrives, Dave Langdon pushes forward the throttle and with a belch of diesel exhaust, from her funnel, the Lady Maureen’s Mitsubishi engine propels her into the race and suddenly we’re under way. 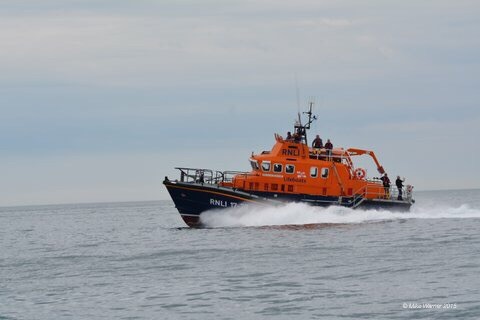 As we steam purposefully towards Paignton and Torquay, the Torbay Lifeboat, a Severn Class All-Weather boat, overtakes at pace, ahead to the waymark buoys and waits respectfully in attendance as the trawlers cruise by. Abaft of us to port, the Dutch pulse trawler “Jan van Toon” (TX-36) gains ground. A welcome visitor to Brixham for many years now, she is an integral part of the proceedings and plays an important ambassadorial role in the association and links with the Dutch fleet. We press on toward Torquay, the bulbous bow of the Lady Maureen coursing a watery furrow beneath the almost glass like surface of the bay. As I move round the vessel from wheelhouse to fo’c’sle I encounter all types of folk in the throes of what for many of them is rapidly turning into a maritime drinks party. Laughter and merriment are the order of the day and the whole atmosphere is incredibly intoxicating. In the wheelhouse I manage to grab a few more words with the skipper. I ask him just what the race means to the men who work this iconic mixed fishery. He speaks sincerely in his lilting Devonian burr and tells me of memories of races past. As I make my way back for’ard I glimpse the fastest boat in the fleet the “Christina” (FD100) overtaking us to starboard, whilst on the port beam the “Carhelmar” (BM23) and “Our Lady Lou” (BM110) jockey for position. A myriad of pleasure craft dart amongst the race field, some with crews in fancy dress, some motoring at speed and hitting our wakes, bumping off in clouds of spray. The Torbay Lifeboat continues to work furiously back and forth, a constant reminder of the superlative role these volunteers play in assuring maritime safety and security around our coasts. The circuit now full, boats vie for place, as engines build to maximum revs and skippers seek out their best track. 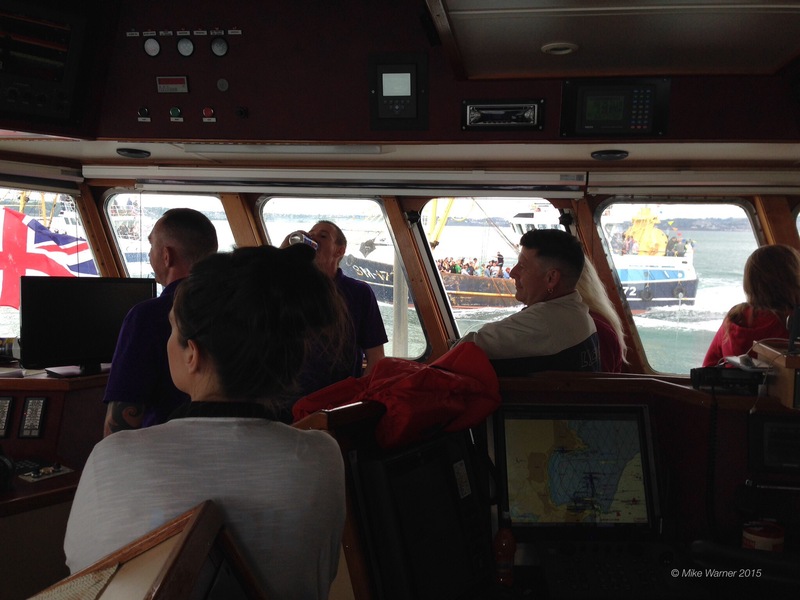 On the bridge, the crew are in constant contact with other vessels and Race Control over the VHF and the ensuing banter is legendary, ribald and jocular remarks being batted to and fro, resulting in gales of laughter that fill the wheelhouse. The spectacle continues to unravel. The truly majestic sight of so many working vessels in formation is stirring in the least. 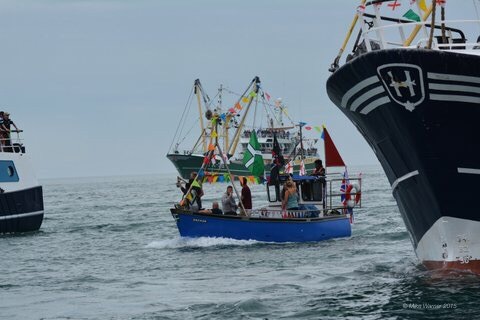 I’m beginning to understand why the people of Brixham, even those unconnected with fishing, go to such lengths to include themselves in this wonderful festival. How for 24hrs it takes over their lives and their town. I take another quick tour of the boat and instantly have a beer thrust into my hand by one of the crew, who grinning, hates to see me short. Descending the companionway from the wheelhouse, I’m struck by the fact that we’re on the final leg. 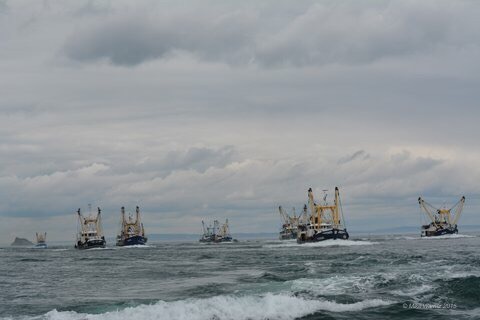 Trawlers ahead and abaft, diesels hammering, bows cutting and every last knot being squeezed, in a final effort to make their time. As I take up position again on the starboard gunwale the Lady Maureen heels over hard a’ starboard cutting the buoy close, and we’re all done. Throttles back, revs drop, and our race is over. Cheers and laughter more audible now, we pick our way back to the harbour, where literally hundreds of race watchers have since gathered. 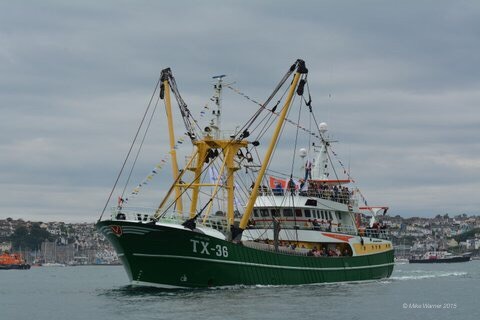 We slowly motor to the fish quay and take our berth alongside the “Barentszee” (BM 361) another of Dave’s boats, placed 2nd last year, but this year playing host to the recently triumphant Brixham RFC 1st XV. As we tie up alongside it would appear their celebrations are set to continue for a long while as yet. The scene now is reminiscent of any sporting cup venue. Drink flows, music thrums, and the aroma of barbecuing pervades the quay. Now the party begins and the results awaited. Although by now completely overawed, l extend my heartfelt and grateful thanks to Dave Langdon and Barry Young and wish them all the best. Once disembarked, I make my way back to the harbour past revellers and residents all beginning to party hard. I need to reflect and take time to gather my thoughts after witnessing such a spectacle and decide to do so over a large and sobering bowl of Moules et Frites. Whilst pondering and enthusing about the day, someone asks me if I’d come again next year?